But its okay. You have a system. You play birthdays, ages, anniversaries, phone numbers, addresses, your license plate number, and divorce date. Those lucky numbers are bound to pay off soon. In the constant pursuit to get rich quick, you miss the opportunity to get rich slow. Homer: I’ve never been so sure of anything in my life. I am going to win this lottery. Marge: Homer, the odds are three-hundred-and-eighty million to one. Homer: Correction, three-hundred-and-eighty million to fifty! And your odds don’t change over time either. The lottery is no different from flipping a coin. Each flip is a 50-50 chance of getting heads or tails. After ten tails in a row, the odds of tails landing again is still 50-50. In other words, the odds don’t change because you play longer. 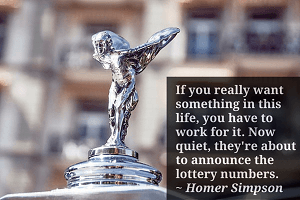 The lottery is one of many ridiculous things we do to attain wealth instead of using the obvious alternative where every dollar you play increases your chance of success. Obviously, saving your money is a better idea than gambling it on an incredibly tiny chance at millions. Saved money, compounded at a decent return, will get you to a million dollars faster than the lottery will. But saving is not nearly as exciting or fun. And it takes time. More time than short-term thinking allows. The chart below shows what happens when you choose the $10 a day long-term lottery over the short-term belief in instant millions. If you’re not reading this on the site, you need to click through to see the chart. A lot can happen when you sock away $10 a day, $3,650 per year, for 40 years. Saving more will beef up your winnings even faster. Of course, if your savings are on track, your goals will be met, your on budget, and have some fun money left over, feel free to feed your urge. Blow some money on lottery tickets. I wish you luck.